There's a certain cannon that goes with the whole vampire lore that's constantly being re-written from the classic Bram Stoker's 1897 novel to Twilight to Count Chocula. The newest version directed, in his feature film debut, by Gary Shore and written Matt Sazama and Burk Sharpless tells the story of how the Romanian prince Vlad the Impaler gets his fangs. Filmed in Northern Ireland the FX heavy feature takes liberties with the real historical prince and the war against the Ottoman Empire. The production is part of a planned Universal Monster's franchise. The first one was supposed to be The Mummy, Dracula Untold was to be the second. There's also the potential of a sequel to this particular film. This story of Vlad claims that he was a child soldier enslaved by the Turks as tribute from his home in Transylvania. 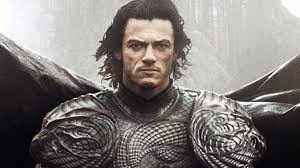 As he was a prince he was raised with the Sultan's son and became a warrior of renown where he earned the name Vlad the Impaler (Luke Evans). Now living back in his castle, the land has enjoyed 10 years of peace. But that is disrupted when some Turk scouts disappear while on a mission. The Sultan's son, Mehmed II (Dominic Cooper) who has now taken his father's position demands not only the tribute of silver from the Prince, but he wants 1000 boys sent to fill his army including his son Ingeras (Art Parkinson). His wife Mirena (Sarah Gadon) reminds Vlad that he promised not to send his son to war and for the sake of his family and country decides he will fight even if it means bartering with evil. According to Vlad the world does not need a hero, it needs a monster. Luke Evans does a serviceable job of the angsty family man/ruler/monster. The battle scenes are mostly played out with a million CGI bats which are fun and visually interesting. The ultimate battle with the Sultan was like Superman getting foiled by Kyrptonite just to even the playing field. And of course there's the will he or won't he drink some blood to continue with the immortal life. You know he will. It's just takes a while for that to happen. And there's a creepy Renfield character uttering the “yes master” line just for those purists and for laughs. The ending begs for another chapter and the actors look better in the contemporary settings, so that's something to look forward to in the future.